Date | Time Sunday, Dec 2nd | 2:00 p.m.
Flint, Mich. – The Flint Firebirds play the final game of a three-in-a-three weekend on Sunday afternoon, hosting the Sault Ste. Marie Greyhounds. Puck drop is set for 2:00 p.m. (ET) at the Dort Federal Event Center. Sunday marks the third of six meetings between the two clubs this season, and the second of three in Flint. After the Greyhounds won the first two meetings on home-ice, the Firebirds posted a 4-2 triumph in Flint on Nov. 9 in the most recent contest between the two teams. At that time, Sault Ste. Marie was in second place in the 20-team OHL. Jake Durham earned a three-point night, scoring twice and picking up a helper en-route to ‘First Star’ honors. Ty Dellandrea (Dallas Stars) and Eric Uba also lit-the-lamp for Flint. Between-the-pipes, Luke Cavallin made 40 saves on 42 shots for his second-consecutive victory. Last season, the Firebirds went 2-4-0-0 against the Greyhounds, who spent most of the season at the top of the league’s rankings. All-time, Flint holds a 6-12-1-0 record in the series and a 4-6-0-0 record in home games. In total, seven games between these teams have been settled by a single goal. Last night, Flint fell in overtime to the Erie Otters at the Dort Federal Event Center. Dellandrea scored twice and Jake Durham, Fedor Gordeev (Toronto Maple Leafs), and Jack Phibbs also found paydirt in the game. The Greyhounds were victorious in Saginaw, defeating the Spirit 7-4. Keeghan Howdeshell scored a hat-trick and added an assist to lead his troops. On special teams, Sault Ste. Marie converts on 23.6% of their power-play chances away from home. 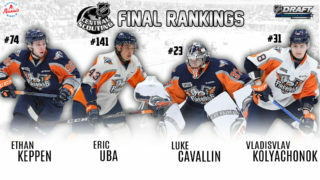 In the 20-team OHL, they rank seventh in the category. The Firebirds sit 14th with the man-advantage at home, scoring 18.5% of the time. The Greyhounds also rank seventh in road penalty-kills, shutting down the opposition on 82.6% of their chances. The Firebirds are 20th at home, killing penalties at a 59.4% clip. It’s a ‘Family Sunday “FUN”day! Come enjoy the holiday spirit and get your picture taken with Santa Claus. There will also be a DIY ornament designing station, while supplies last. Also, every Sunday Firebirds’ home game is a Family “FUN”day featuring up to 2 free kids tickets with the purchase of an adult ticket, as well as a post-game ‘skate with Firebirds players,’ and an autograph signing session with Firebirds players following the game. Assistant captain Jake Durham holds the edge in goals-scored and total points for the ‘Birds. 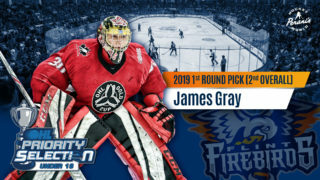 He finds himself in a three-way tie for 18th in goal scoring in a league out of 353 players that have scored at least one OHL goal this season. Through 28 games played, Durham has lit the lamp 16 times and assisted on 11 goals for 27 total points. He has recorded two points in four of the past five games. Flint captain Ty Dellandrea averages better than a point per game. In 24 contests, he has a team-high 14 assists along with 12 goals for 26 total points. Dellandrea has points in 13 of his last 14 games and has scored two goals in back-to-back games. Eric Uba has six points in his past three games, and a total of 21 points (11G, 10A) in 28 games. Fedor Gordeev leads the defensive unit with three goals and 13 assists for 16 points in 24 games played on the season. He scored the game’s first goal last night, which initiated the fourth-annual ‘Teddy Bear Toss.’ First-year defenseman Vladislav Kolyachonok has picked up 11 points in 16 games since joining the Firebirds after the season had started. In net, Emanuel Vella holds a 5.39 goals-against average (GAA) and a .863 save percentage (SAV%) in 19 appearances. Vella has backstopped Flint to one win and one overtime defeat this season. Luke Cavallin is serving game two of a five game suspension and has compiled a 5.61 GAA and a .854 SAV% across 17 appearances. He has picked up two wins and one overtime defeat between the pipes. Evan Morrison has appeared in one pre-season game for Flint, making 9 saves on 13 shots over 32 minutes of on-ice action. Philadelphia Flyers’ 2017 first-round draft pick Morgan Frost leads the entire league in points with 52 in 28 games this season. His 34 assists also rank atop the OHL. He rides a six-game point streak (5G, 11A) in to Sunday’s match. Last year, Frost finished the regular season tied for the most assists in the league (70) and second-most points (112). Barrett Hayton (Arizona Coyotes) was the Coyotes’ first-round pick, 5th overall, in this year’s NHL Draft. He has 15 goals and 18 assists in just 20 games played. Mac Hollowell tops the defensive troops and ranks third overall on the squad with 31 points (9G, 22A) in just 24 contests. Winger Rory Kerns leads all first-year players for the ‘Hounds with 11 points (4G, 7A) through 28 games this season. Between-the-Pipes, goaltender Matthew Villalta (Los Angeles Kings) has backstopped the Greyhounds to 11 wins, including last night’s 7 – 4 triumph over the Spirit in Saginaw. He made 29 saves on 33 shots faced in the tilt. With 17 appearances this season, he has a 3.05 goals-against-average (GAA) and a save percentage (SAV%) of .904. Newcomer Ethan Taylor has played in ten games this season, with a 3.22 GAA and a .884 SAV%. Taylor also has four wins in net. The game will also be televised live across the province of Ontario on the OHL Action Pak on channel 435 for Rogers TV cable subscribers and channel 476 for Cogeco TV cable subscribers. OHL fans with cable television in Ontario can add the OHL Action Pak to their television plan to catch the Firebirds in action, home or away all season long. 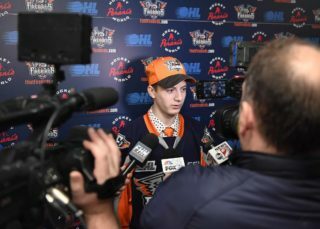 Along with Sunday’s game, 65 of the Firebirds’ 68 games throughout the 2018-19 season are also scheduled to be televised live across the province of Ontario on the OHL Action Pak. Presented by Great Lakes Sandwich Co & Cafe, Sunday evening’s dinner menu for the Blue Line Club features chicken stew, chili, garden salad, dinner rolls with butter, and assorted desserts.. The menu is available to all sponsors and season ticket holders for $18 per person for an all-you-can-eat buffet, $12 for one trip. Dinner RSVP’s are encouraged by emailing Karla Turner at karla@flintfirebirds.com.